Following the glyteer, I looked for literature that dealt with ichthammol. I hear that the oldest report on ichthammol was published in 1882 (Unna PG Aphorismen uber Schwefeltherapie und Schwefelpraparate. IV. ICHTHYOL. Monatsheft Praktische Dermatologie 1882;1:328–33). I’d like to read it if I have a chance. This paper written in 1998 reviewed how much steroid or ichthammol could suppress inflammation (erythema) caused by UVB on the skin of healthy volunteers. In the above table, PSSO means ichthammol (pale sulfonated shale oil). Compared to placebo or irradiated control subjects, ichthammol or steroid (hydrocortisone) applied to subjects are low in redness, indicating erythema was suppressed. The above table contains the results of the experiment which were conducted with four levels of UVB: MED (minimum erythema dose)×1; MED×1.25; MED×1.6; and MED×2. As 5 kinds of topical drugs were used including control, the experiment was conducted on 20 cases in total. As to each treatment case, a significant difference was statistically analyzed by means of analysis of variance (ANOVA) for 4 UVB levels at a time, and resulting p values are listed in the table. For example, the intersection between “Placebo” column and “PSSO4%” line has the value of 0.0001, significant difference was seen between the placebo group and the PSSO4% group at p=0.0001 level as to 4 levels of UVB irradiation. Between Hydroc.0.5% and PSSO4%, we can find p=0.5169, therefore there seems to be no significant difference at the level of p=0.05. 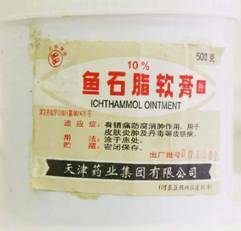 That is to say, 4% ichthammol ointment has the same erythema suppression effect as 0.5% hydrocotisone ointment. Hydroc.0.5% equivalent potency is very weak in the anti-inflammation effect. Readers may wonder what applying such a mild agent means. But it is clear that it is more effective than placebo, and it does not lead to addiction or rebound, which differs from steroids. 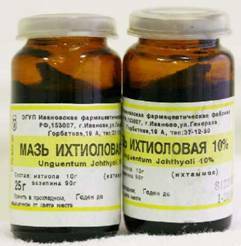 If topical corticosteroids were free from side effects such as addiction and rebound, I would not look at such a mild drug as ichthammol. Seeking how to support patients who want to withdraw from steroid ointment treatment means trying to develop new drugs such as Protopic and reviewing the effects of old drugs such as tar replaced by steroids. The subject of this study seems to be ICHTHOSIN (4% ichthammol) commercially available in Germany. The package and tube have“Neurodermatitis”(“atopic dermatitis” in English) printed in red. While I was working as a dermatologist, I used to buy interesting over-the-counter topical drugs every time I traveled abroad. Please look at a part of my collection of ichthammol ointments. This was made in China and packed in the 500 g container. There was also a 10 g tube type sold at a few dozens of yen. I bought this in Russia. It was sold at about 20 yen per 25 g.
The above was sold at a drug store in the U.S. It cost 2 to 3 dollars. I’m sorry we can’t buy these cheap tar drugs any more in Japan. I’d like to add that the UVB erythema suppressing action, which was handled in the paper introduced above, is not the only effect of ichthammol. It also has antibacterial effect, which topical corticosteroids lack, that reduces the number of Staphylococcus aureus and really useful for AD treatment as well as LTB4 suppressing effect (LTB4 released from keratinocyte is one of the causative factors for itching), and is therefore considered comprehensively effective for suppressing AD.